Perfect Fit. Fits 8 pound babies through 35 pound toddlers. Unpadded edges allow you to easily tighten your sling as much as necessary to perfectly fit you and your newborn. The long tail give you plenty of room to accomodate your growing child or a larger user. Many couples can share the same sling. Comfortable. 100% Hand-Woven Cotton breathes and is cooler than stretchy wraps which require a lot of wrapping. Woven fabric supports your child better than stretchy knits. Lightly Padded Shoulder is comfortable without being too bulky. Multiple carrying positions. Your young baby can be worn facing in. Babies with head control can face out. Older, heavier babies can be worn on your hip. Quick and easy to use. There is no complex wrapping each time you just want to calm a fussy baby or quickly get your baby out of the car seat and into your sling. The easy to position shoulder design naturally spreads the fabric across your back. On the go convenience. 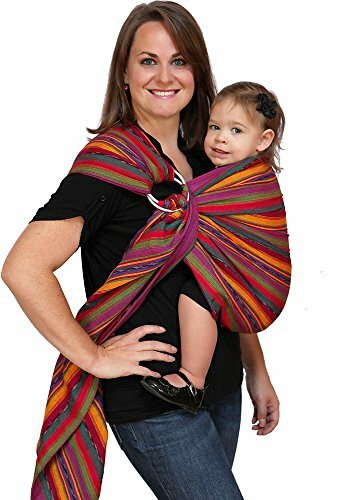 Your Maya Wrap Sling fits in your diaper bag. The zippered pocket is perfect for a diaper and wipes or other essentials. It is large enough for a cloth diaper. The tail can be used as a nursing cover when breastfeeding. Safety. Your Maya Wrap Sling is CPSC compliant and ASTM Compliant. The Aluminum Rings are made in the USA by SlingRings of aircraft grade aluminum. Each is tested to 250 pounds. Easy Care. Your sling is machine washable in cold water. Line dry. If you have any questions about this product by Maya Wrap, contact us by completing and submitting the form below. If you are looking for a specif part number, please include it with your message.